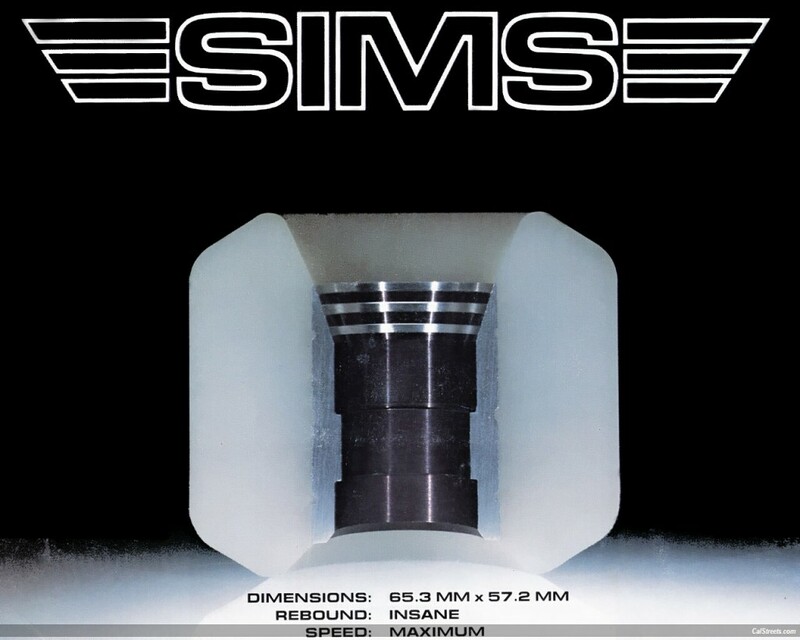 Here is where I get confused because I seem to think Sims was run by Brad Dorfman and Vision in the 1980s? By the late 70?s I got very busy getting snowboarding off the ground, and licensed Sims Skateboards to Brad Dorfman in 1981. At the time we had the #1 team with Brad Bowman, Dave Andrecht, Steve Rocco, Todd Swank, Pierre Andre, Chris Strople, Wally Inouye and a lot of the guys who would become very influential in skateboarding. Many of these guys were the Who’s Who of skateboarding. It’s amazing the guys who were on my team and what they went on to do later in life in the board sports world. Pierre Andre started Etnies, and Steve Rocco took over everything. And another name you can put in there is Dave Swift, who became the editor of a big skateboard magazine. Muir formed Dogtown Skateboards, and Todd Swank formed TumYetos. Lamar went on to form Lamar Snowboards. But at that time, around 1981, I put my focus on snowboarding after Brad Dorfman took over the skateboard license. What’s funny in all of this is that just a couple of weeks ago, Brad Dorfman and Dale Smith made a new deal to license Sims Skateboards. 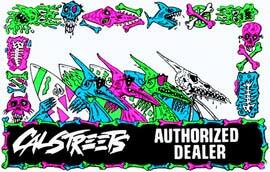 They are spearheading the licensing of Sims Skateboards 25 years later. When I licensed to Dorfman in 1981 there was a recession going on – 90% of the skate parks shut down and within 18 months skate shops were going bankrupt. And that was gnarly to the major skateboard companies, because it wasn’t COD back then. The bad debt was overwhelming. Stores could not pay their bills, and hundreds of shops and parks went out of business. That was one of the reasons I licensed to Dorfman. Many of these shops would close down owing us $10,000 or $20,000. When Rocco went to COD, that took the risk out of the skateboard industry. He was smart. Sims made a big surge in the early 1980s and then we were knocked off the mountain by Powell. Stacy Peralta came on board and built a tremendously strong team and product line with George Powell. He had Steve Caballero and Lance Mountain on the team, and stayed on top some time into the mid to late 80s until the day Stacy left, and that is the day Powell collapsed. Literally imploded because Stacy, Rodney and most of the team bailed. When I asked a bunch of skateboarders to name transitional skateboards, Gary Holl sent me this image of a 1980s Sims Steve Rocco model. Were you still involved with the company when this board came out, and how is it transitional? The SIMS Rocco skateboard changed the known universe at the time. Everything in skateboarding was about vertical riding on ramps and in pools, and then Sims introduced the Rocco board and wheel to the world, and it started a full revolution back to streets. But that was on the cusp of when you were getting out of Sims Skateboards and into Sims Snowboards? 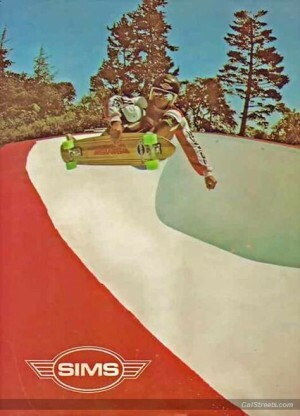 The mid to late 1970s is when the Sims company or product line or team or the whole deal had the most influence on the sports, from the wide decks when we ran our 3 Ways Wide ad. That was a revolutionary ad because the day we ran that ad on the back cover of SkateBoarder, every narrow skateboard in every warehouse and factory and store became obsolete. If I had been a better businessman, I would have unloaded all our inventory before running the 3 Ways Wide ad. It was a huge development, but Alva had a lot to do with skateboards going wider, and you can’t ignore that. Why is the 3 Ways Wide ad significant? This was the first ad showing a wide skateboard. Everything was really narrow prior to this ad. This ad changed the face of skateboarding. This was also the ad I was delivering to SkateBoarder Magazine after which Novak began accusing me of dirty tricks. What is your side of that “Wonder Boy” story. 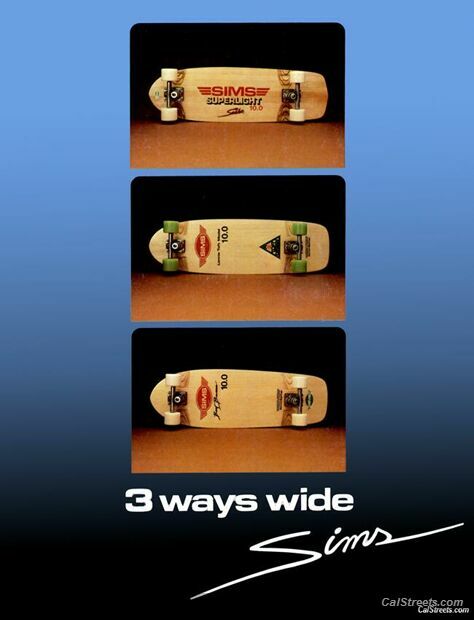 I made exactly one trip to SkateBoarder Magazine and that was to deliver the “SIMS 3 Ways Wide” advertisement. I made the drive from Santa Barbara to San Juan Capistrano, because if they received the ad the next day, I would have missed the deadline. When I walked into the room where the production crew was preparing all the ads for blue line, I said “Wow, look at all those ads! Rich Novak of Santa Cruz Skateboards got wind of my appearance at SkateBoarder Magazine and spun this two-minute appearance into a convenient lie, to disparage me for decades in the skateboard and snowboard industries, and to exalt himself as a ‘knowledgeable’ and ‘safe keeper’ of the sports. About this ad, Tom Sims said “The Quicksilver advertisement I sent you belongs in the Powell Skateboards section. This was George Powell’s first advertisement, and we had a handshake deal that SIMS would be his Worldwide Exclusive Distributor. He promised me this enticing deal if I would promote his skateboards and be in his advertisements, and put my endorsement signature on the decks, as SIMS was the most prestigious name in the sport at the time. Without this ad as proof, it would be my word against his.” Ad courtesy Tom Sims. Novak’s other stunts in business are actually far more repugnant. I will not discuss those here. One of the reasons Novak was so pissed is because when I ran that ad, all the narrow boards were instantly outdated. If he had known about that ad he would have unloaded the tens of thousands of narrow skateboards he had in his warehouse. Novak was pissed because he didn’t see the wide thing coming. He got caught with his pants down, as did everyone. I should have dumped all my narrow boards at half off. I just wasn’t a greedy enough or savvy enough businessman.